ARKA's Ecopod is a revolutionary design in coffins made from naturally hardened, 100% recycled paper - mainly newsprint and office paper - and a non-toxic natural hardener, the Ecopod is ideal for a natural burial or clean cremation. 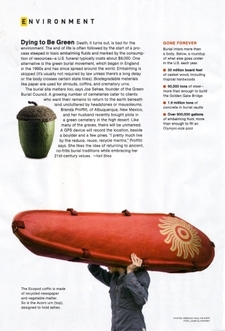 The Ecopod was featured in the National Geographic's "Environment" section. OBIT Magazine - "Going to Ground"
Treehugger noticed it a long time ago, back in 2005 - great eyes, Treehugger! To learn even more about the history of the Ecopod and the inspiration behind Hazel Selina's original design - a cross between a seedpod and an Egyptian sarcophagus - you can visit their website: https://www.ecopod.co.uk. There are some wonderful stories on their press pages and they've got a small workshop in Brighton, UK, where each one is molded carefully by hand. Hundreds of Ecopods have been successfully used throughout the UK since 1998. The Ecopod is extremely durable - it weighs around 40+ pounds and yet even the small size can carry 200 pounds! It is covered in handmade mulberry leaf and recycled silk paper. Each color has its own silkscreened design - Blue=Doves, Red=Aztec Sun, Green=Celtic Cross. (Click here for colors and patterns). White silk paper and Gold are also available as options. NOTE: -- White Ecopods should be handled with gloves as the oil from your hands will stain the immaculate silk paper. We call the UK's "Large" a medium, as its molded shape and tapered style lend itself to a less-robust body. It can carry a lot of weight, but the fit is better for an average-sized person. Ecopod will be creating a large size in the future, but for now "it's not for every body"
The ARKA Ecopod is a handmade sculpture. It is NOT the 'cheap' natural coffin one could expect. Yes, it's made from recycled paper - and ceramic sculpture is made from dirt; even so, our suggested retail pricing for the Ecopod is just about the same as an average traditional casket price in the regular market, and it's our top-of-the-handmade line. Due to its unique and handmade nature, the Ecopod is in extremely limited supply in both the US and the UK and pre-orders are strongly suggested. 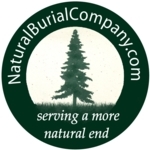 Contact the Natural Burial Company to find out about pre-ordering one if the US is out of stock, and we usually know which of our resellers may have one on hand for you. The Ecopod arrives strapped together. We recommend leaving the coffin strapped until ready to use. There is a simple quilted cotton mattress inside. Additional natural fiber blankets or quilts can be added, as can flowers, dried herbs and sweet-smelling branches. 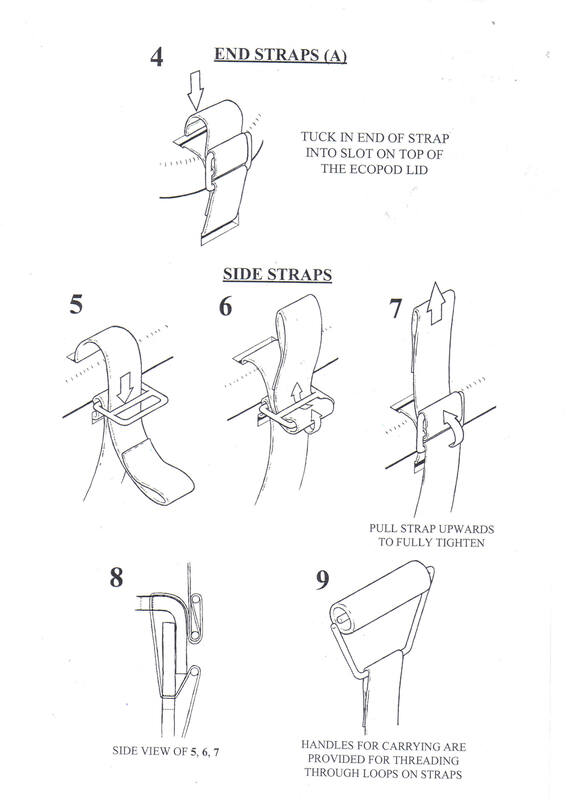 The Ecopods are carried with 6 metal and bamboo handles inserted through the loop ends of the straps. 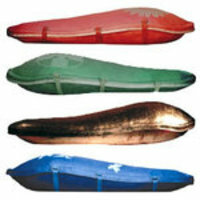 The metal handles can be easily removed prior to burial. 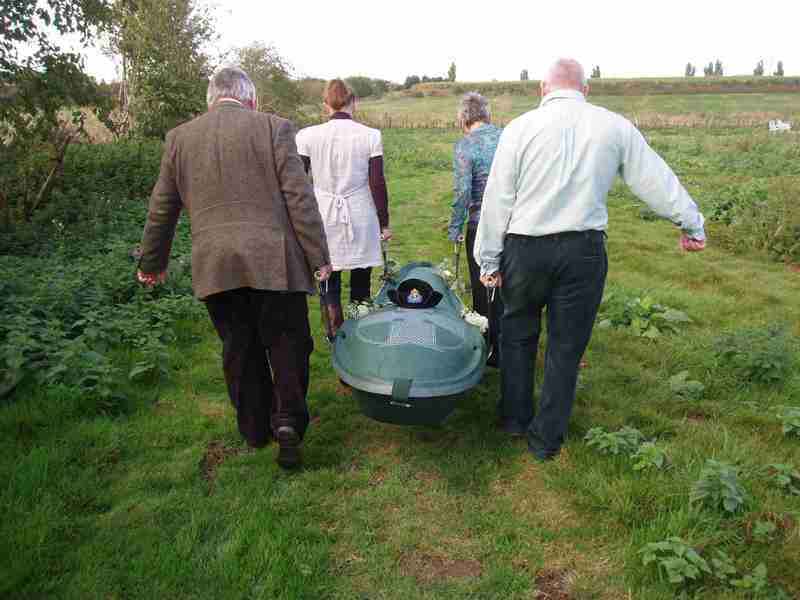 The Ecopod can be traditionally shouldered by six-pallbearers. 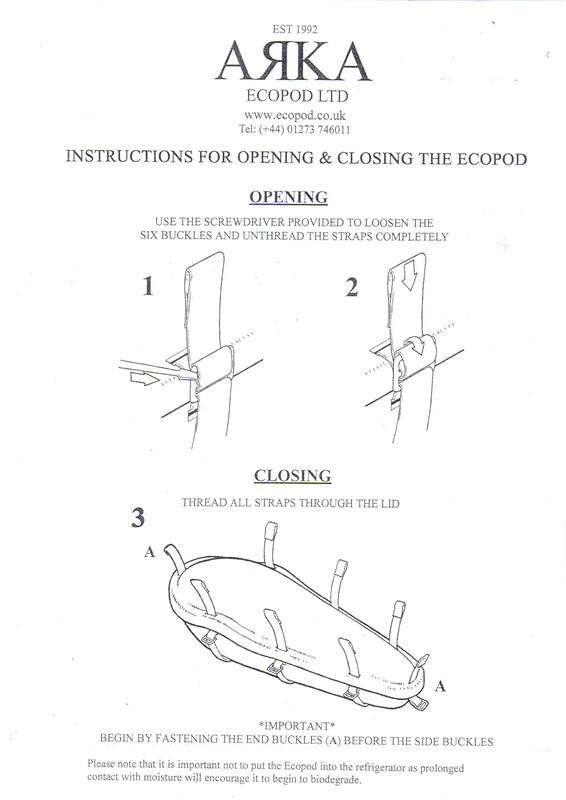 The Ecopod can be easily lowered by hand using either straps or ropes in the traditional manner. Placement of two 4x4 boards crosswise on the bottom for the pod to rest on will allow the straps to be removed easily. Remember, a shallow grave (less than 36" - 18-20" of soil maximum on top, not including the mounded earth) is preferred in a natural burial. The burial shown here is done without an outer burial vault or grave liner. The Ecopod is durable and will not melt in the rain. If it does get wet, simply allow it to dry and it will re-harden to its original strength. If the paper gets damp, unless it is rubbed raw, it too should dry back to the near-original condition. There is a small amount of metal in the Ecopod - a couple of bolts hold the straps in place and there are metal and bamboo handles. If there's concern about the metal the handles and buckles can be easily removed before lowering the Ecopod into the grave. 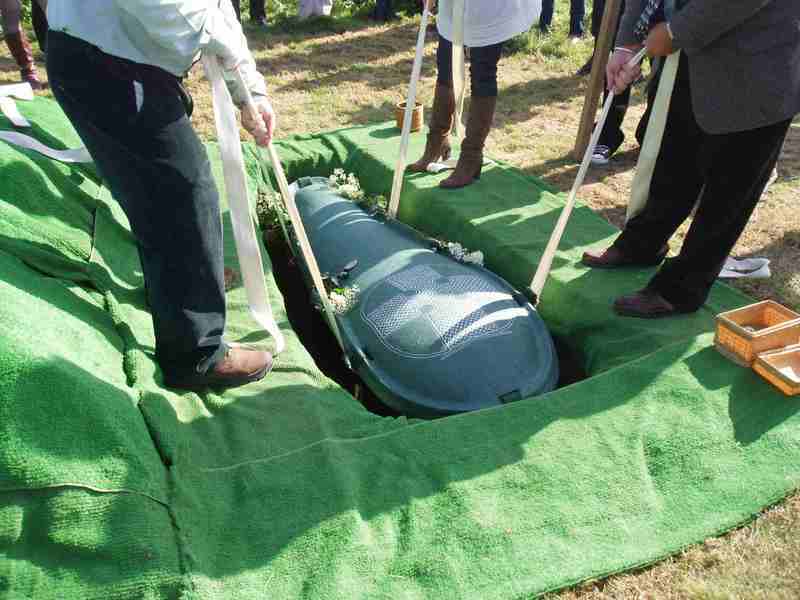 Due to their extremely light weight, natural coffins can be lowered easily by hand. They also work just fine with traditional lowering equipment. Most bodies have been adequately cared for before burial and, if managed properly, leakage from an unembalmed body generally does not occur. 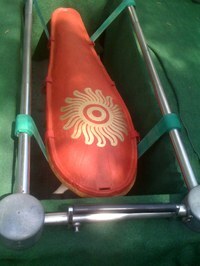 If additional protection is required, a wool pad, quilt, or thick cardboard on the bottom of the coffin, placed under the liner, should be adequate. Plastic liners are not necessary! As always,we suggest no synthetic clothes on the deceased, nor non-degradable materials in the coffin.